Flashback - Officer Decker is at a restaurant getting a sandwich when he gets shot by a robber. Chloe on the phone, Apparently the man who killed her father is being released. Lucifer shows up to tell her that Dr. Martin isn't taking his calls. She's very distracted and annoyed. Lucifer determines he needs to be someone other than himself. Dan shows up. He knows something's wrong, but she fluffls it off. Chloe visits prison to complain about Joe Fields' release from prison. He's getting leave to go to his granddaughter's christening. She gets a call from Lucifer that he wants to follow Dan around. She's distracted and basically tells him yes. She follows Fields. Dan notices Lucifer watching him. Chloe comes upon the transport vehicle where the guards have been shot. Fields is dead as well. Dan and Lucifer show up at the crime scene. Dan doesn't know why Lucifer wants to follow him around. Lucifer tells him he's intrigued Dan agrees, but tells Lucifer to stay out of the way. Ella is around again. Chloe was the first on the scene. She's in the interrogation room. It doesn't look good that she was stalking her father's murderer and he is then executed. Chloe wants Dan and Lucifer to work together on the case to clear her. Ella shows up to give information. Rodney Lamb was a prisoner personnel who served time with Fields. Chloe is at home. Maze is going on an interview dressed like Maze for a pre-school aid. Ha. Chloe doesn't think this job is good for Maze. Trixie suggests maze just be herself on the interview. Chloe is being sentimental about her dad. Trixie wants to know why they never talk about grandpa. There's a knock on the door. When she opens it a woman points a gun at her, telling her she's going to pay for what she's done. The woman is Fields' daughter. She thinks Chloe killed Fields. Trixie comes out and Chloe gets the gun out of her hand. Tina breaks down. She has a video that she received from a layers in the event of her father's death. Chloe looks at the video. Lucifer shows up dressed like Dan. Dan gives him information about Rodney. They arrest him. Chloe is looking at the video Fields left for his daughter. In the video, he claims he didn't kill the cop. Turns out that there was no way Fields could've recorded the video then made it across town to kill Chloe's dad. Rodney admits to killing Joe Fields. It's obvious Rodney didn't kill Fields. Dan gets up to leave. and Lucifer does his trick. Dan figures out Rodney got paid to take the rap. Rodney tells his story. Maze shows up at Dr. Martin's office. Dr. Linda doesn't answer the door. Then she turns around and Maze is sitting there in her office. She wants a character reference, but Dr. Martin is freaked out. Maze figures out that Dr. Martin knows Lucifer is really Lucifer. She's completely freaked out. She asks Maze to leave. Chloe shows up at the police station and she shares information about Joe Fields. 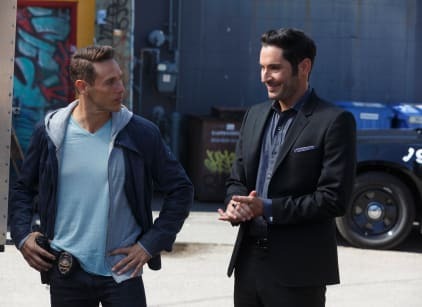 Lucifer and Dan share information about Rodney. Flashback to when Chloe was a rookie and meets Dan. She has an armful of binders and he helps her. He shows her around. Dand and Lucifer show up where Chloe is looking at her father's file. Chloe notices they are dressed the same and thinks it odd. Dan has more information for Chloe. They found another suspect. Dan and Lucifer show up at a bathhouse and Holy Hell - they're both shirtless and HOT! Lucifer puts on an American voice for a minute and then stops after Dan insists he starts taking stuff seriously. Dan wants him to be calm, but Lucifer is his loud self. Chloe is in an office and gets a box of information from the Deputy she was arguing with earlier. Ella is watching her looking through the stuff, even though she's not on the case. Ella starts looking through the files for her. Chloe gives her a hug for wanting to help. Back at the bathhouse, Lucifer and Dan continue to try to get information from Boris. They want to hire Boris to kill...Lucifer Morningstar. Boris agrees. They shake on it and he gets arrested. Chloe starts questioning Boris in interrogation. She gives him information and threatens him. Boris tells her John Decker was sniffing somewhere he didn't belong. Chloe doesn't understand, because she claimed her dad was a beat cop. Dan congratulates Lucifer for a job well done. Lucifer tells him he wasn't lying about hiring Boris to kill him. Chloe shows up. She thinks her father's murder was a hit. She doesn't want their help. Maze comes into Chloe's place. She's frustrated she can't find a job. Maze tells her Dr. Martin isn't talking to her. She asks what all the files are and Chloe shares information about the case. Dan is walking along the boardwalk. Lucifer follows without Dan knowing. He copies Dan's walk. He goes into where Dan ducked into. Turns out that Dan is an imrov artist. He's playing Lucifer and Lucifer is highly upset. Of course, he yells at Dan. Afterwards, they have an argument. Dan wants him to open up, but Lucifer refuses citing Dr. Martin and the results of that. They have a lot of common though they come from different backgrounds. Dan opens up why he started an Improv class. They bond. Lucifer shows up at Chloe's house, dressed like himself. Maze is upset with Lucifer about Dr. Martin. They start arguing. Chloe interrupts, because she's close to finding information. Chloe determines that Deputy Warden might have had something to do with Fields' murder. They head to the prison. When they get there, Chloe learns from Dan that the Warden gave them the slip. Chloe is upset that she didn't catch her father's killer. She feels like a failure and is down on herself and Lucifer cheers her up. When they get to the apartment, it turns out Maze has captured Deputy Warden. Chloe is about to call it in when Lucifer suggest she take advantage of the situation before doing that. They want her to exact some revenge on him first. Chloe pulls out her gun. She's going to shoot Deputy Warden but backs down. Maze shows up at Dr. Martin's office again. She wants to share her excitement at getting her first job...as a bounty hunter for the LAPD. Dr. Martin doesn't open up the door, she just pushes the check back under the door. She seems a little torn that she's letting Maze walk away. Then she does open the door. She questions how they can be friends....because she's a demon and Lucifer is the devil. She wants to know how to get over that. Maze wants to buy her a drink. It seems that Dr. Linda is going to leae. Chloe makes a grilled cheese and Lucifer grabs it first. He tells Chloe he doesn't much care for his father, but admires Chloe for following in her dad's footsteps. She hugs Lucifer.